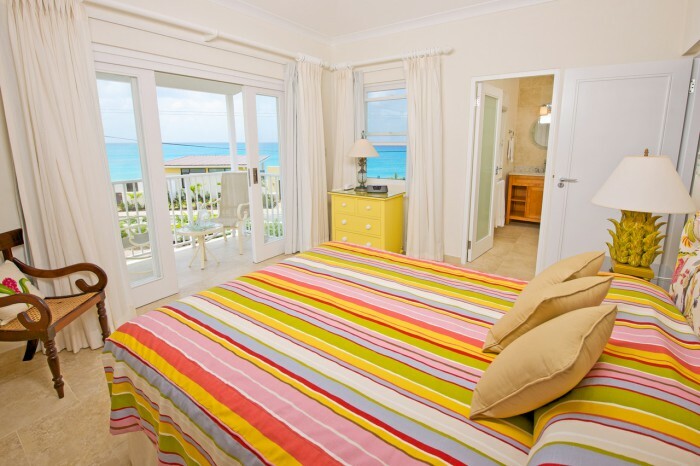 Cane Vale Beach House is a Barbados luxury beachfront villa located in Welches, Christ Church, on the south coast of Barbados. Offering six bedrooms, six bathrooms and a powder room, the design of this holiday rental property is thoughtfully laid out on 2 levels. The ground floor offers five bedrooms each with en suite bathrooms and air conditioning. Four of the bedrooms have double beds and the fifth has twin beds. This beautiful beach rental villa has a large open plan living, dining and kitchen area. These areas open onto the fabulous terrace with fantastic 180º panoramic sea views. The terrace is furnished with high tables and seating for twelve people. There are also sun loungers perfect for relaxing on the beach and an outdoor shower. The laundry room is conveniently located to the side of the house and includes a large washing machine and dryer. On the first floor of this beach rental villa you will find master bedroom with king size bed, ensuite bathroom, walk in closet and a comfortable sitting area which leads on to a large beautiful deck. This deck is furnished with loungers and a gorgeous plunge pool which overlooks the perfect sandy beach and the calm crystal blue Caribbean Sea. There is also a fully equipped kitchenette and laundry room on this level. The master bedroom is designed so that the bed faces out to the sea. For guests with small children there is an idyllic children’s room off the master bedroom. A perfect little hide away for a young guest and ideally situated for mum and dad to enjoy their privacy while keeping them close by. Cane Vale’s design lends itself to various rental options. There is the option for a perfectly self contained 1 bedroom suite upstairs. Guests can also rent it as a three, four or five bedroom beachfront villa. For large families this holiday rental property can be offered in its entirety with six bedrooms. Located a stone’s throw away from Oistins, where the lively Friday night Bajan fish fry is a perfect way to enjoy a taste of true Barbadian culture. The supermarket and several casual bars and restaurants are all within walking distance. The popular St Lawrence Gap is a quick 5 minute drive away. The magnificent fixtures and finishes of this holiday rental property will have guests wishing they never had to leave. Call or send us an email to book this beachfront vacation rental. Start planning your perfect Caribbean getaway today! This fully air-conditioned three bedroom villa is part of a private and peaceful townhouse community near Oistins and is opposite the popular surfing spot of Freights Bay, with the beautiful stretch of Enterprise Beach and the superb Cafe Luna restaurant a very short walk away. 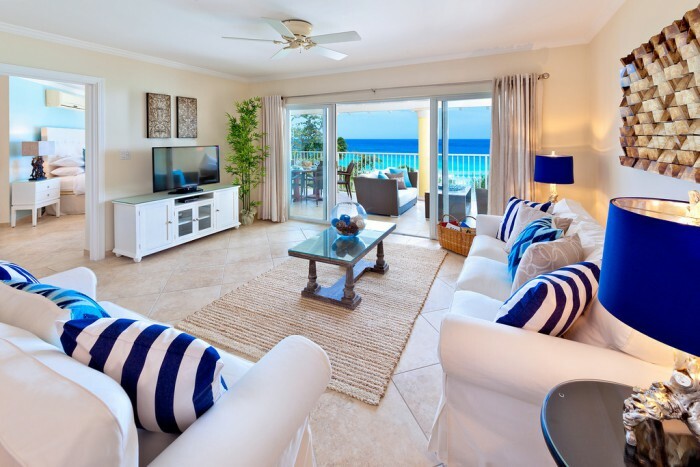 Sapphire Beach Condos on Dover Beach is a very popular holiday destination with its beach front location and walking distance to the many restaurants and nightlife of St Lawrence Gap. #517 is a top floor three bedroom fully air-conditioned penthouse with access to the two pools, beach and gym.